My life&apos;s rhythms have ebbed and flowed to the tides of hunting seasons – squirrel season, duck season, deer season. Most weekday evenings my dad would spend making sure his equipment was ready; knives were sharpened and rifles were cleaned; camo and waders were laundered and wiped down. Weekends were for the actual hunting experience. He would leave early in the morning, long before we kids awoke, and he would return late in the day. My fondest memories of childhood are the days that, when he returned, Dad let me clean squirrels with him in the garage. At the time, I thought I wanted to be a doctor, so the dissection of a rodent was right in line with my idea of excitement. And I quickly realized that my dad was a lot more fun when he was cleaning squirrels than he was sitting in a recliner watching ball games. I know you find it hard to believe, but “Si” wasn&apos;t so gregarious in those days. Sometimes, I might go days without hearing him talk. He didn&apos;t necessarily like to interact with me, a preteen girl, in other contexts, but when we were cleaning the carcasses, he talked like there was no tomorrow. He talked about the squirrels, how to clean them and how to do it right. He talked about guns, the different types and what type you chose for what kind of hunting. He talked about values, how God meant for people to do certain things in a certain way. And he talked about family. You see, our family has always been in the hunting business, long before they got paid for it. My grandmother used to tell me stories about the Depression, and how hard it was on everyone, but how she could always rely on her five boys to head out and find food when there was nothing on the table. Her husband, my grandfather, was far away serving in the Navy, but her boys made sure there was food for the family, as they used their hunting skills to ensure their family&apos;s survival. I married outside the hunting circle, so my adult life has had more rhythms of sports seasons – football season, basketball season, baseball season. But I always knew that my boys would want to hunt. Since their dad isn&apos;t a hunter, we&apos;ve taken them to Louisiana to join in with cousins, uncles, and yes, grandfather. They&apos;ve always returned with stories similar to my squirrel stories. Pumpa, as they call my dad, is always so fun in the duck blind or patiently waiting on the deer to move within range. He shares stories and laughs, and there&apos;s almost a secret society to the hunting crowd. There are inside jokes, and long looks between hunters. I envy the closeness, and I&apos;m glad my boys have been able to be part of that inner circle. I am rarely asked if I am a supporter of gun rights. I guess that&apos;s natural, considering my family makes a living from a byproduct of their hunting activities. But if asked, I&apos;m quick to advocate for the Second Amendment, and while that may come naturally, I&apos;ve thought the logic through for myself. As a history teacher, I professionally study the Founding Fathers and have spent many hours looking over the words, “A well regulated Militia, being necessary to the security of a free State, the right of the people to keep and bear Arms, shall not be infringed.” It&apos;s a simple statement, but so full of meaning. The meaning includes the fear of government taking away the people&apos;s rights, including the most basic right of self-defense. That meaning has not changed over the years. In addition to hunting, which for some people is still a necessity and not a recreational activity, guns provide for safety. As a mother, believe me, I care very much about the safety issues surrounding gun ownership and use. Statistically, gun owners are careful and diligent about safety. The research sets my mind at ease, and only strengthens my support of gun rights. 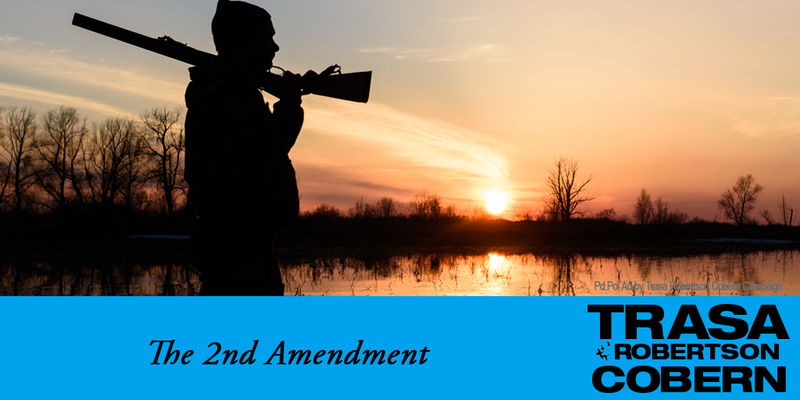 Guns provide security for people of all kinds, and owning them is Constitutional. But what means the most to me is what I&apos;ve seen firsthand. Learning to shoot and sharing time hunting with family brings people closer together. It brought me and my dad together in a way that nothing else could at the time. And I can confidently say that my sons are better men for the time spent hunting and bonding with other men in the family. Also, check out the other Personal Stories Trasa has shared, Meet Trasa & Her Family, view her Service & Experience and her Background. See why Trasa loves Texas and Tarrant County.